This highly original, provocative, and poetic work explores the nexus of time, truth, and death in the symbolic world of medieval kabbalah. Demonstrating that the historical and theoretical relationship between kabbalah and western philosophy is far more intimate and extensive than any previous scholar has ever suggested, Elliot R. Wolfson draws an extraordinary range of thinkers such as Frederic Jameson, Martin Heidegger, Franz Rosenzweig, William Blake, Julia Kristeva, Friedrich Schelling, and a host of kabbalistic figures into deep conversation with one another. Alef, Mem, Tau also discusses Islamic mysticism and Buddhist thought in relation to the Jewish esoteric tradition as it opens the possibility of a temporal triumph of temporality and the conquering of time through time. 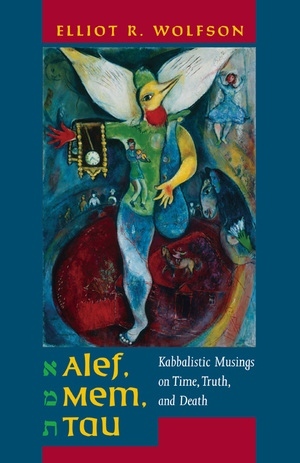 The framework for Wolfson’s examination is the rabbinic teaching that the word emet, “truth,” comprises the first, middle, and last letters of the Hebrew alphabet, alef, mem, and tau, which serve, in turn, as semiotic signposts for the three tenses of time—past, present, and future. By heeding the letters of emet we discern the truth of time manifestly concealed in the time of truth, the beginning that cannot begin if it is to be the beginning, the middle that re/marks the place of origin and destiny, and the end that is the figuration of the impossible disclosing the impossibility of figuration, the finitude of death that facilitates the possibility of rebirth. The time of death does not mark the death of time, but time immortal, the moment of truth that bestows on the truth of the moment an endless beginning of a beginningless end, the truth of death encountered incessantly in retracing steps of time yet to be taken—between, before, beyond. Elliot R. Wolfson is Judge Abraham Lieberman Professor of Hebrew and Judaic Studies at New York University. Among his most recent books are Language, Eros, Being: Kabbalistic Hermeneutics and Poetic Imagination (2005), Pathwings: Poetic-Philosophic Reflections on the Hermeneutics of Time and Language (2004), Abraham Abulafia—Kabbalist and Prophet: Hermeneutics, Theosophy, and Theurgy (2000), and Through a Speculum That Shines: Vision and Imagination in Medieval Jewish Mysticism (1994).